I’ve gone back and forth with my opinion on this subject for years, but I believe it depends on the situation you’re in, what you want to convey in the image and who your target audience is. I am talking of course about including people in your landscape photos. When I began photographing landscapes years ago, I always went out of my way to make sure there wasn’t a single person in my photographs. After all, I wanted to convey nature and the vast expanses of the beautiful places I was visiting. Having a random person in the shot ruined that for me, especially if it was just a tourist who wouldn't get out of the way. I still think that way today a lot of the time. Not every person deserves a spot in a landscape photograph. It has to be a certain kind of person, a person that compliments the scene and fits in to it, rather than takes away from it. A picture of Tunnel View in Yosemite National Park during incredible light would be ruined by a tourist wearing a fanny pack and holding his iPad up in the air to take a snapshot. Or, maybe it wouldn’t; I guess it just depends on the story you’re trying to tell with your image. When I took the image above, I was leading a photography workshop in Death Valley National Park. 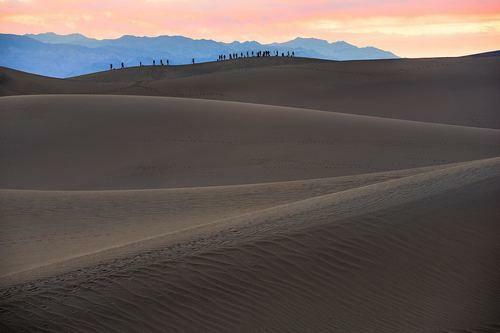 We were photographing the Mesquite Flat Sand Dunes at sunrise. I’ve lost track of how many times I've photographed these dunes, and throughout the years I have found a few secret routes I use to get away from hoards of visitors that venture into the dunes from the parking lot. As the sky began to explode with color, I looked toward the parking lot and saw a massive group of photographers—probably another workshop—all lined up along the crest of a dune with their tripods set up. One of my students was frustrated by this scene, because it was just about impossible to keep these tiny photographers out of a composition, but I did my best to explain that this was a great time to embrace the human element of a scene and use the group of photographers as a way to add scale to the scene. It actually ended up being one of my favorite images from the trip. Footprints and all. So next time you're capturing a beautiful landscape at sunset, take a step back and consider whether or not adding a person to the scene would take it to the next level.